Well the big project is done. 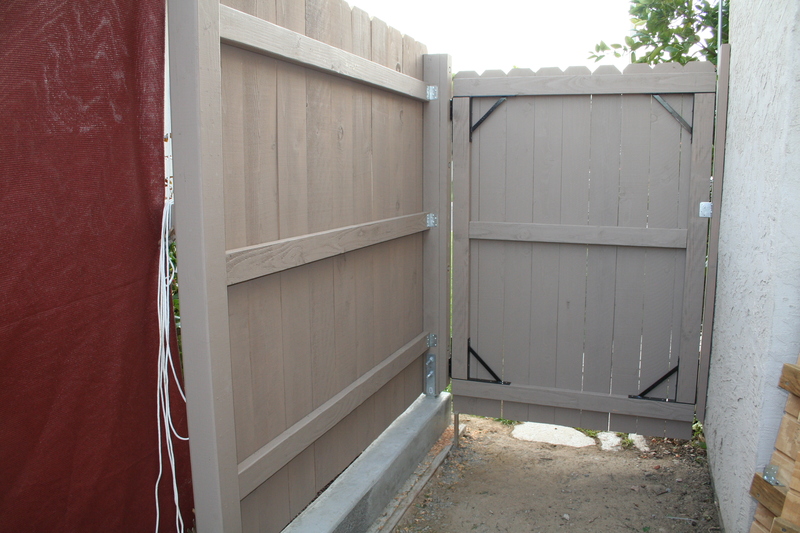 It is a fine 6-foot side yard privacy fence atop a well-built concrete knee wall that keeps the wooden fence above the grade of the neighbors’ yard, which varies from 7″ higher than our property at the front to 16″ at the back. 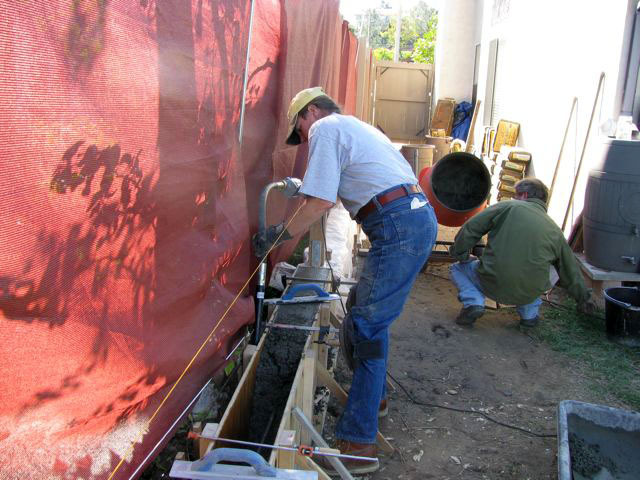 The wall is 53-feet long, supported by an 8″ x10″ footer reinforced with rebar. That baby ain’t going anywhere. I built it for eternity. It replaced the most rotten, crumbling, too-short falling down fence you ever saw, which was a completely inadequate division between my private backyard homestead and a really obnoxious neighbor. The lady and her kids are quite nice, but this guy is loud, dumb, and intrusive. I’ve had ample opportunity to develop a deep-seated dislike of his personality just listening to him blaring his weirdness from 20 feet away. He yells at the kids and the dog. He’s mean to my favorite neighbor lady friend on the other side. Then he pokes his head over the falling-down fence and tries to start a conversation with me at 7 am when I’m in my pajamas with pillow face. I had to build this fence, people. It was a matter of survival. Tearing down the old fence didn’t take all that much muscle, as the termite-eaten boards were light as a feather; it just had to be wrangled apart, posts wiggled out, and the whole load driven to the landfill. But living without a fence between the two yards, no matter how lame a fence it was, is not acceptable in suburbia. So I bought what seemed like a vast length of shadecloth fabric, affixed grommets to the top and bottom edge, and strung a construction screen from conduit poles to work behind. It worked pretty well although it didn’t completely block line of sight, and blew over a couple of times during heavy rain and winds, but served the purpose of separating the yards and keeping the neighbor kids from just wandering through. Then the digging commenced. 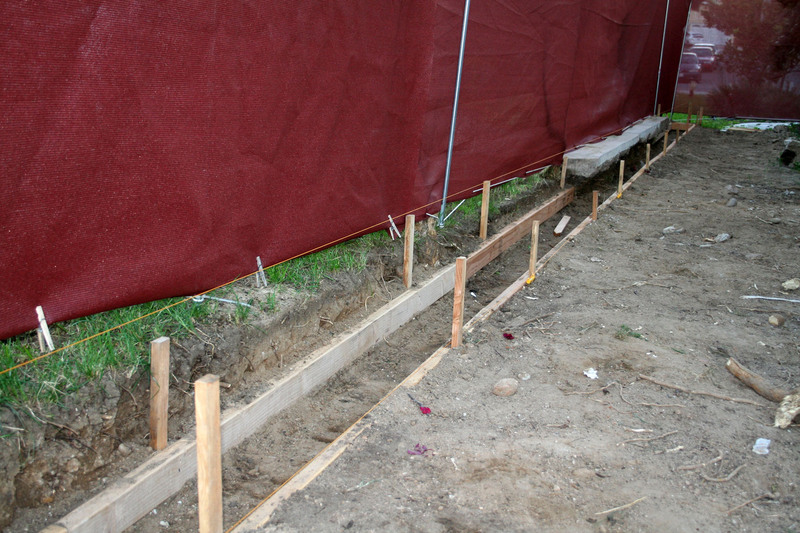 I planned to form a 10″ x 8″ footer centered on the property line, and once the fence was down it became clear just how much excavation that would require. Plus, the ancient bougainvillea bushes on the neighbor’s side had been planted right next to the old fence line and were terrifically overgrown, so they had to be radically trimmed (ouch!) 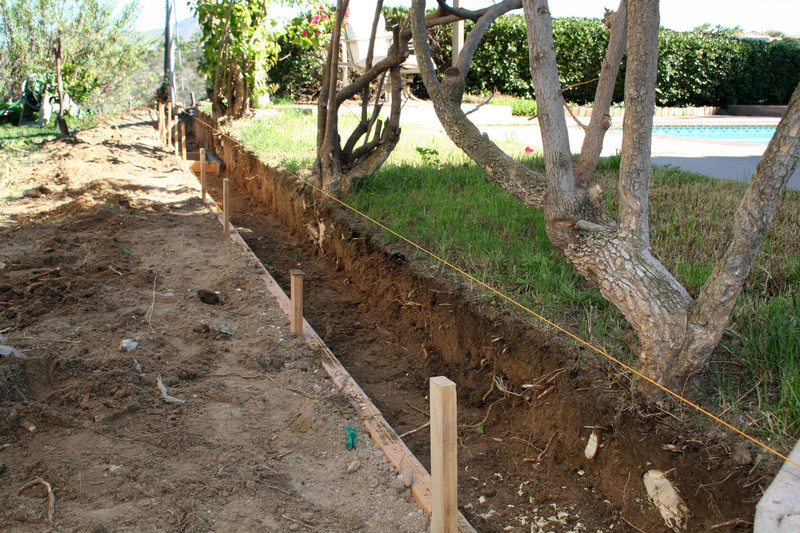 and as the footer trench was excavated, roots sawn through and removed. Lotsa roots. It probably took me the better part of two weeks to get the fenceline cleaned up and ready to form for pouring the footer. The fabric screen went up and down several times, needing moved back as the dimensions took shape and the need for more space to work became apparent. 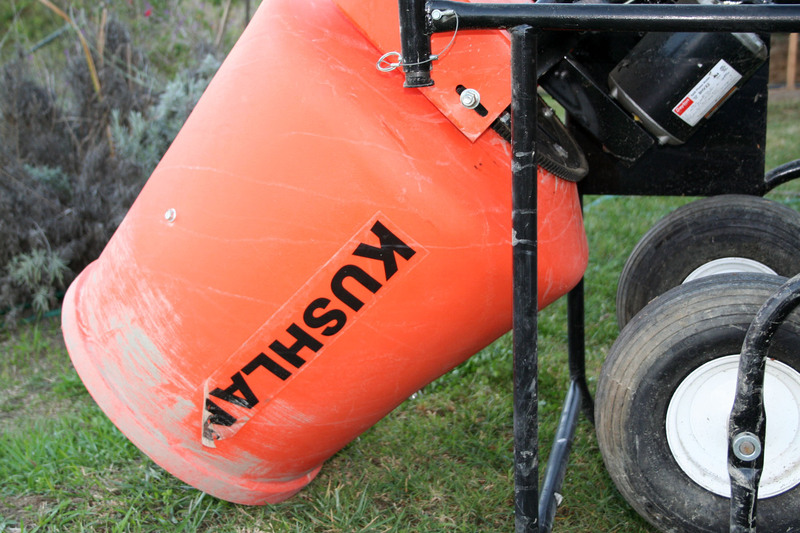 As we have no frost level to speak of here in San Diego, I started my footer right at ground level and only made it 8″ deep. Which is still overbuilt for this light-duty application, but that’s how I like to do things. The top of the form is nothing more than oiled 2 x 4’s fastened together and plumbed to stakes. A jig built from two 10″ crosspieces and a short board made setting the level and width of the far side relatively easy. 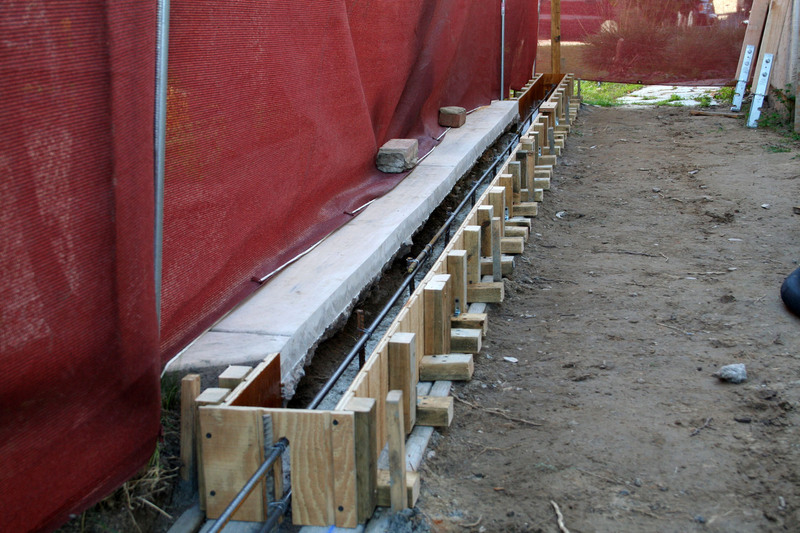 Once the form boards were in and level, I finished digging out the remaining 4 – 5 inches, ran rebar down the length, and fixed 2×3’s along the center to form a key slot for the wall to bond to. 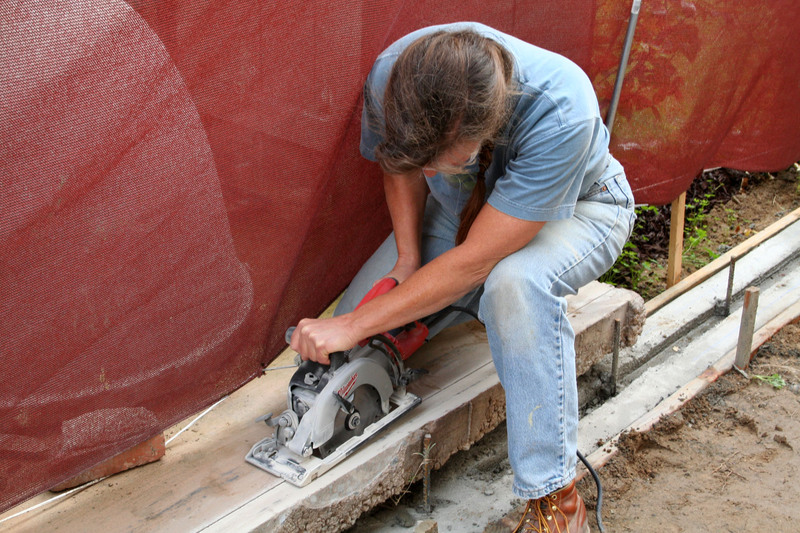 One of the biggest challenges I encountered was working around the edge of the 16-foot slab that the previous neighbors had poured right up to the old fence. 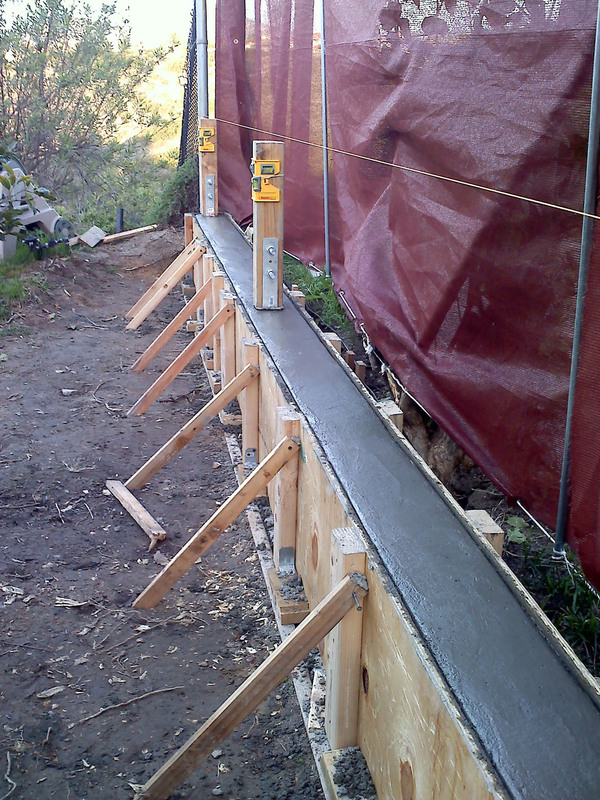 We called a friend over to cut it even with the property line and I poured the footer underneath it, thinking I could somehow form the wall around the dang thing and incorporate the edge within the new concrete. As I got closer to wall construction I decided the slab needed cut back again, and the new cut edge became one side of the form for the first, low wall section. Of course, I had to buy a honkin’ saw to get the job done. Every girl needs a worm-drive Milwaukee saw with diamond blade, don’t you think? 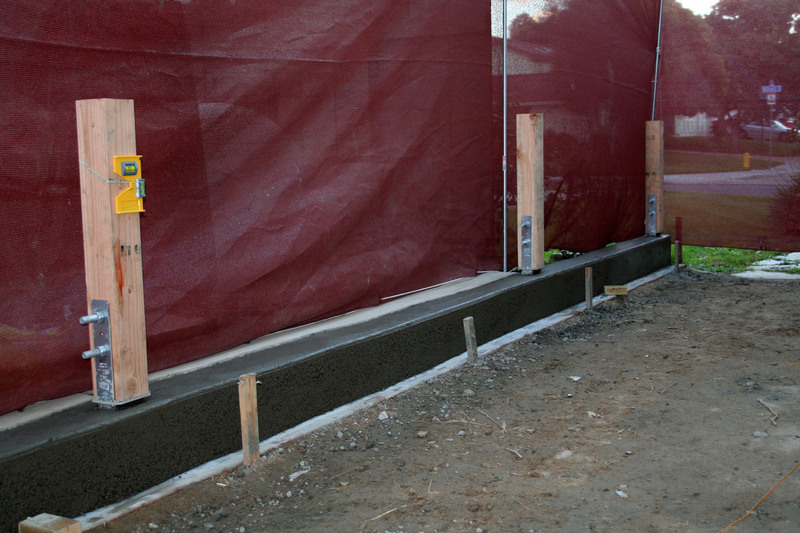 Front wall section poured, Thanksgiving weekend. I needed to get the front part of the fence and gate built and the backyard closed back up before we left on our December trip, so I worked at it very steadily and took advantage of the holiday weekend. The project got a huge boost toward completion when my sister arrived for a week over Christmas and offered to help finish the rest of the wall. What a great Christmas present! The weather cooperated, amazingly, and we targeted New Year’s Day for the big pour. 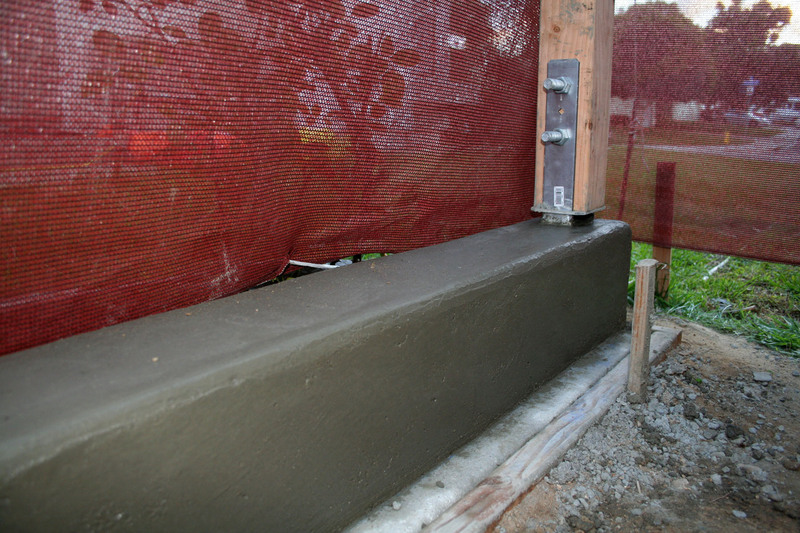 January 2nd, we poured the last section, the 16-inch high portion. I lost count of the number of bags, sorry to say. It was a LOT of concrete though. I was very pleased with how it turned out, and it was a great learning experience. Although I’ve done a few concrete projects before I’d never built a concrete wall, and figured this out bit by bit, reading books and adapting instructions to fit my particular situation. 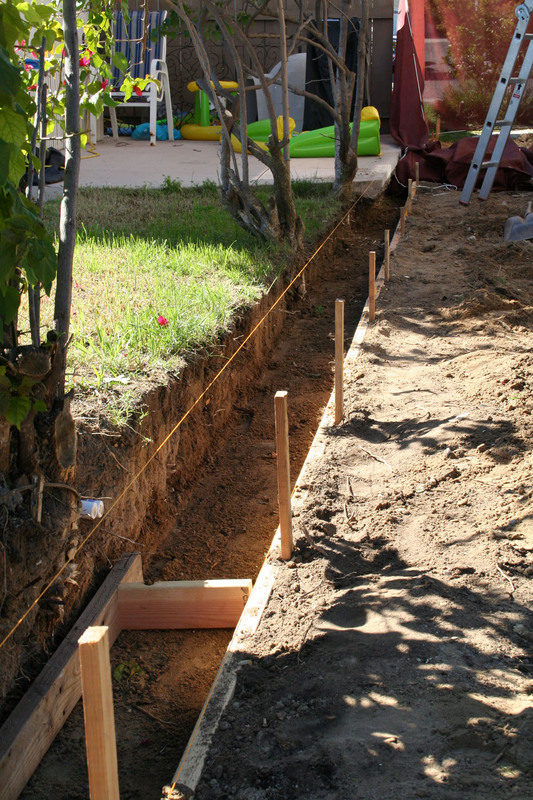 The forms held well, the posts are aligned and plumb, there is rebar running through for strength, and it looks great. 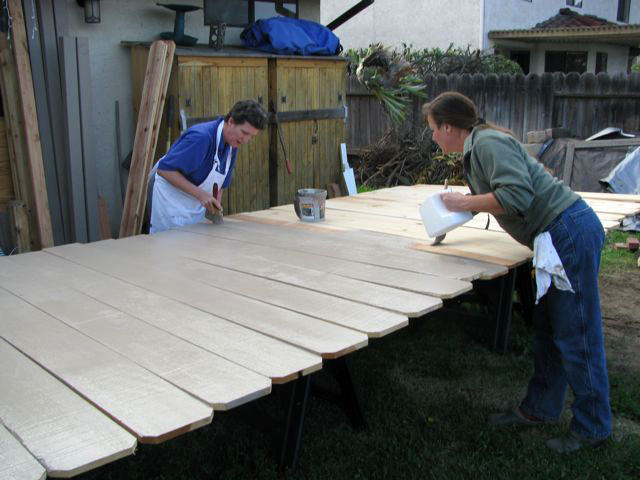 In addition to forming and pouring concrete, the fence boards got two coats of stain, both sides, prior to putting them up. 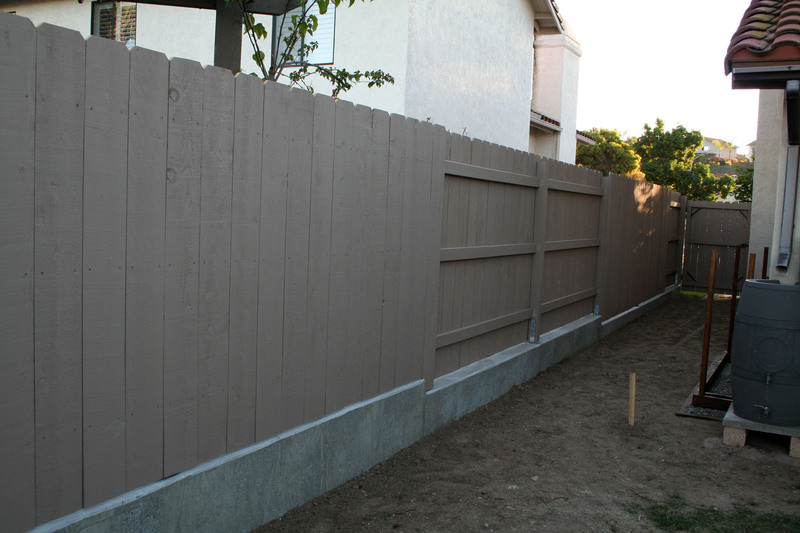 It is much easier to paint a fence before it’s built. But it was a patience game, since there were too many to lay out all at once and painting one side at a time meant flipping twice, allowing for drying in between. Several nights of drizzle set the paint job back until I learned to cover the freshly painted boards with plastic overnight. The job seemed endless, but I persisted with it, working by worklight in the evenings during the week, and was able to finish building the fence atop the wall by January 6. I am glad it’s done, and glad it turned out well.